Twin Peaks: The Return, or What Isn’t Cinema? Whatever you watched Twin Peaks: The Return on, what you were watching fell a long way from either the first two seasons of the series or the released-to-cinemas, feature-length prequel Twin Peaks: Fire Walk with Me (1992). 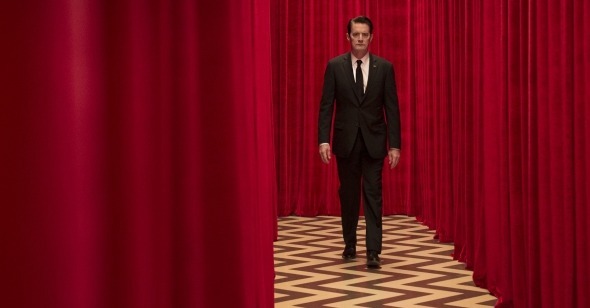 Kyle MacLachlan’s FBI Special Agent Dale Cooper—affectionately “Coop”—the heart of the series, has here become a structuring absence, trapped in the other-dimensional space of the Black Lodge since the ABC series finale. In his place we get two MacLachlans: Coop’s evil doppelgänger, a one-man criminal scourge who has been using his fed credentials to wreak untold havoc in Coop’s good name; and Dougie Jones, an insurance salesman living in the Las Vegas suburbs who has been created as a kind-of placeholder to receive Coop at the end of the period of his detainment, into whose life a discombobulated Coop is dropped, appearing like something of a holy fool in his amnesiac bumbling to relearn the simplest human functions. In one of the series’ richest running jokes, Naomi Watts, playing Dougie’s wife, Janey-E, takes her husband’s imbecility in stride. You don’t have to be of even average intelligence to bluff your way through middle-class respectability in this country; in fact it probably helps if you’re not. When I’ve been asked to weigh in with a vote for 2017’s best films and have had the inclination to do so, I have voted for Twin Peaks without getting too bent out of shape over the question of whether or not it’s cinema. Arguing for its inclusion is the fact that the year-by-year “Best” lists that I keep for private purposes are already chock-a-block with television movies and miniseries. Many auteur careers through the decades, particularly in the years before the gradual privatization of European TV, have been underwritten in no small part by TV money, particularly when the national theatrical exhibition model in question hasn’t been particularly amenable to the sort of work being done (cf. Peter Watkins and Alan Clarke in the United Kingdom, Alexander Kluge in West Germany, Jean-Luc Godard and Anne-Marie Miéville with 1976’s Six fois deux/Sur et sous la communication.). Lynch would have it that this is precisely the situation in the United States today, and has testified that in this “sad time for alternative cinema… the new arthouse is cable television.” And if this is how an artist of his stature reads the economics of his situation I am as willing to follow him to Showtime as I am willing to follow Tsai Ming-liang to the white box gallery. One of the jobs of the artist is to find the space that is most conducive to the practice of their art at the given moment; one of the jobs of a functioning cultural commentariat is to follow artists to those spaces. Such questions as to the place of cinema per se in a world of proliferating moving-image stimuli are nothing new. I had recent occasion to revisit certain scenes from Wim Wenders’s Room 666, a film shot in a room at the Hôtel Martinez during the 1982 Cannes Film Festival, comprised of fixed-camera, direct-address “interviews” with participant filmmakers who are posed the question “Is cinema a language about to get lost, an art about to die?” and left to answer in solitude. Television and home video were at the moment the primary causes for concern, as emphasized by the presence in the frame of a TV set that goes on about flashing its images, oblivious to the parade of world historical artists passing in front of it. “We aren’t all that dependent on television,” says Werner Herzog, after settling in and taking off his shoes. “Film aesthetic is something apart and separate. TV is just a kind of jukebox, you’re never inside the space of a theater… Wherever life touches us most directly that’s where you’ll find the cinema.” Michelangelo Antonioni will have none of the pessimism inherent in the question; he mentions that he has recently completed a picture on videotape, and that he’s “sure that the range of artistic possibilities offered by video will make us feel differently about ourselves.” Rainer Werner Fassbinder, less than a month from his untimely demise, hastily outlines a distinction between “sensation-oriented cinema which tends to be colossal and bombastic,” “very individual cinema or national cinema of individual filmmakers,” and “cinema which is indistinguishable from television.” Room 666 was broadcast in June of 1982 on Antenne 2, the state television station that is today France 2. A restoration of Fassbinder’s 1972 series Eight Hours Don’t Make a Day, whose five feature-length episodes premiered on Cologne-based Westdeutscher Rundfunk, has just had its North American premiere at the Museum of Modern Art, where recently the Twin Peaks revival was screened in full. The first two episodes of Lynch’s series were presented to thunderous applause at Cannes 35 years after Wenders made his film, 27 years after Lynch was viciously booed while accepting the Palme d’Or for Wild at Heart, and a full century after Marcel Duchamp displayed a porcelain urinal at Alfred Stieglitz’s studio on 291 Fifth Avenue. For a hundred years now it’s been possible to put a toilet in a white box and call it art, but God forbid you put a TV miniseries in MoMA and call it cinema. Twin Peaks: The Return felt as though connected to something ancient, like Brakhage’s tree, while it registered as contemporary in a way that few works this year did—not in that facile “the movie/TV show/painting/sculpture we need now” way, but as though it had sponged up something of the pestilential mood of the day: the crawling conspiratorial paranoia and the abundance of Boomers gone wild, from pot-panic-addled Jerry Horne (David Patrick Kelly) bugging out in the woods to Dr. Lawrence Jacoby (Russ Tamblyn) reborn as an angry-old-man spraying saliva on his webcam as he transmits anti-everything “Wake up sheeple!” vitriol in the online alter-ego of Dr. Amp. The pacing of the series, compared to the more usually dialogue-and-incident-rich world of serial television, is contemplative, but an ambience of free-floating anger lies over it, and the stretches of stillness are frequently riven with outbursts of hysteria. In episode 11, a leisurely game of catch between three young boys ends with the discovery of a bloody, badly-beaten woman crawling out of the undergrowth; a confrontation between Mädchen Amick, reprising her role as Shelley, and her daughter (Amanda Seyfried) nearly escalates into vehicular homicide; William Hastings (Matthew Lillard), an amateur paranormal investigator, has the contents of his skull emptied as though with a melon baller; and a gunshot shattering the glass at the Double R diner sends Deputy Sheriff Bobby Briggs (Dana Ashbrook) out to confront a surly, suspicious child in camo who reads at a glance as a future mass shooter; a shrilly shrieking woman leaning on her car horn in sheer panic, and her passenger, a young girl in the throes of some kind of fit, her mouth overflowing with viscid goo. The middle-aged members of the original cast, some of them most famous as beautiful youths, like Tamblyn and Richard Beymer, both of the 1961 West Side Story, had gotten old. The teenagers of the original cast, like Ashbrook with his shock of white hair, had settled into middle age. Seyfried was among the new, younger generation of characters introduced, many of them in the way that meat is introduced to a sausage grinder. Among the series’ many casualties are a frisky young couple in New York, a feral Caleb Landry Jones, and Eamon Farren’s Richard Horne, the local dope runner who becomes understudy to his likely daddy, the evil Cooper—though the quarter-century-old murder of coked-up homecoming queen Laura Palmer (Sheryl Lee) retains its position of primacy. Drugs, always an essential part of local commerce in Twin Peaks, are bigger business than ever, rolling in over the Canadian border and inundating the entire country. Before bottoming out, Seyfried’s Becky is seen in lolling back on the burgundy upholstery of shitbag addict boyfriend Jones’s white Pontiac Trans Am to luxuriate in the bliss of being young and beautiful, and having the wind in your face while incredibly, incredibly high. The same episode introduces a minor character played by Hailey Gates, a stringy-haired young mother with a sore-pitted junkie’s complexion who’s barely roused from her stupor by the explosion of a car-bomb across the street in the Las Vegas-area Rancho Rosa Estates housing development, an environment sufficiently soul-sucking to drive anyone into the depths of addiction. Later, at the end of episode 9, the musician Sky Ferreira appears with the hobgoblin-ish appearance of the true meth-head, holed up at a booth in the roadhouse, digging her nails into a “wicked rash” in her armpit and talking about getting canned from her burger-flipping gig. Jones’s character is similarly introduced in the process of being bounced from his job, and little indicators of straightened circumstances are visible all over town. The kids aren’t all right.